*Must have a minimum of 10,000 Lifetime Points to be eligible for this upgrade. Congratulations on reaching the Hoshi Black Card milestone- you’re movin’ on up! Due to name personalization on your new membership card, please allow up to 4 weeks to receive your upgrade package. *Use of this card is reserved exclusively for the person whose name is registered to the account number on the card. 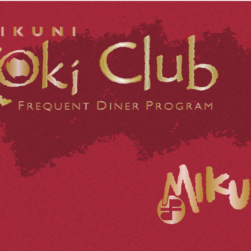 Mikuni Restaurant Group, Inc. reserves the right to change or discontinue this program, or any individual Koki Club account when there is an abuse of benefits. 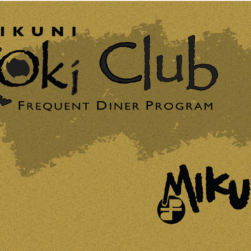 Tags: black card, black club, koki club, koki club card, membership, upgrade.